PayPal is one of the most widely-recognized e-wallets in the world, and it’s available at most non-US online gambling sites. I recommend using Paypal for online gambling transactions because of its security, simplicity and low fees. Here’s a list of the best sports betting sites that accept Paypal deposits. The only difference between this list and the list of top gambling sites overall is that all of these sites have Paypal as their banking option, while some others may not. As you may have noticed, the list includes zero sports gambling sites that accept US customers. 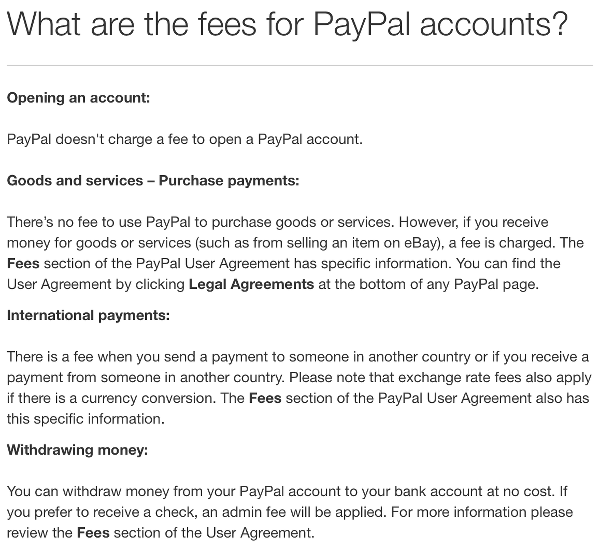 Paypal’s US customers are prohibited from transferring money to online gambling websites. Log-in to your gambling account and go to the cashier or the equivalent (could be called “Banking” or “Deposit” as well). See the list of deposit options and choose Paypal (no harm in checking out the other options in case one of them is a better fit for you). You have to write down two types of details to make a deposit. First, you need to determine the deposit amount and enter a promotion/bonus code if you have one. Second – after clicking ‘Submit’ – you’ll be taken to Paypal.com where you have to log-in and approve the transaction. You will have the money on your gambling account instantly after approving the transaction. To withdraw money from a gambling account to a Paypal account, go to your gambling account’s cashier and select Paypal as the withdrawal option (it will often be the default option since you used it to make the deposit). Then you enter the amount to cashout and you’re done. Most gambling sites (and all of the Paypal sportsbooks listed on this page) cover all fees for transfers between gambling websites and your Paypal account, so transfers to and from a gambling site are free. So are you subjected to any fees? If you use a credit/debit card to fund your Paypal account, you’ll pay a 2.9% fee for the deposit. If you make the deposit via bank transfer, though, depositing money to your Paypal account is free. Withdrawals from Paypal to your bank account are free, so suggesting you make a bank transfer deposit, using Paypal is free for all of your gambling-related transactions. Once you’ve got your Paypal account set-up (the verification process takes a few days), using Paypal to make a gambling deposit is easy and simple. Plus, money transactions between your Paypal account and the gambling site are instant. You never have to give any online sportsbook your credit card information when using Paypal. This is especially useful for those who deposit to multiple sites (which, as I’ve previously mentioned, is recommended). Transfers between your Paypal account and your gambling account are free Most gambling websites process Paypal deposits and withdrawals for free, but the same goes for the majority of payment options. Paypal transactions are delivered instantly, but that is also common for most payment options. Paypal, one of the most popular online wallets in the world, will celebrate its 20th anniversary in a few years. The roots of this online banking service go back to 1998 when four people – among which Max Levchin and Peter Thiel – founded a company called Confinity. It so happened that X.com – a company founded by none other than Elon Musk – also had an office in the same building. Instead of competing with each other, the two companies decided to join forces in March 2000 and to re-brand as PayPal in 2001. Paypal grew as eBay’s most popular payment option. As eBay gained popularity in the US, and eventually across the world, so did Paypal. After spreading into eBay’s biggest international markets, Paypal directed its attention to growing outside of eBay. For the first couple of years, Paypal gained users by offering the most convenient way for eBay users to pay and receive money for auctions. As eBay spread worldwide, Paypal followed and soon reached a global audience. Then, naturally, it was time to spread outside of eBay, and nowadays Paypal operates in over 200 countries. eBay acquired Paypal in July 2002 for $1.5 billion (Musk, the company’s largest shareholder, made $165 million). In 2003, Paypal not only exited the US gambling market but stopped serving as a payment processor at online gambling sites altogether. It took seven years for the company to return to the internet gambling market – however, they’re still yet to re-enter the US gambling market. Several top-class gambling sites accept Paypal transactions. Americans are unable to use Paypal for gambling purposes, but for the people outside of the US, Paypal is a good way to transfer money to and from gambling websites (and can be used at many online stores as well).